WHAT - HOW - WHERE? What are the benefits offered? 15% discount on 8 single flights (or 4 return flights). Free check-in luggage of 20kg with each of these 8 flights booked. Weekly travel offers for Erasmus students. 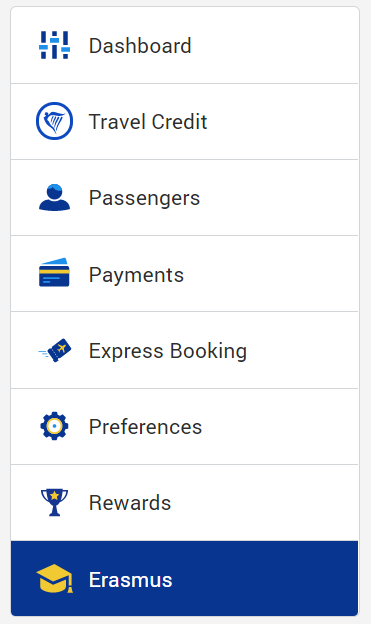 Tailored Ryanair in-journey offers on the mobile app. Flights from 16 June to 31 August inclusive. It won’t be possible to use the discount on the mobile applications (iOS, Android). When does the offer start? The offer will start from 1st September 2017 onwards. This offer is a way of helping exchange students and interns to travel during their exchange period, so it is only applicable for flights booked, at least, 28 days in advance and for travelling dates between 1st of September to 15th of June. Does the discount apply to every flight I book with Ryanair? No. The offer is only available for 8 single flights booked, at least, 28 days before the date of the flight and being this within the 1st of September and the 15th of June. Can I use this discount for flights that I have already booked? No. The offer is only applicable from the 1st of September 2017. Even if you have already booked flights for any date after the 1st of September 2017, the discount is not applicable as the flight has been booked before the launch of this partnership and/or not following the correct booking process through the dedicated booking platform. Who can get access to the discount? Every ESNcard holder properly registered in ESNcard.org and with a valid membership is eligible for the offer. A membership is valid if the ESNcard has not expired. 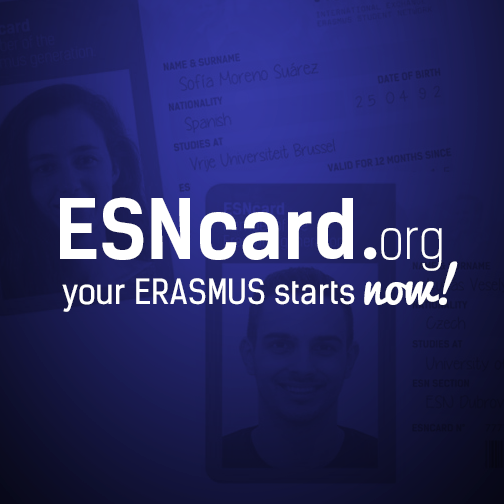 Please consider that the ESNcard is a membership card of the Erasmus Student Network and any member needs to be either a student or intern in a mobility programme or a volunteer of our Organization. If you want to know whether you are eligible for the ESNcard, please visit this page. How do I access the benefits? Get yourself an ESNcard, if you do not have one already. Register at ESNcard.org and activate your advantages by adding your ESNcard number (under the barcode) to your user profile. Fill in all the information requested in your ESNcard.org profile. This is really important, as it is used to identify the passenger as an ESNcard holder, hence, a person eligible for the discount and other perks. Go to Ryanair’s ESN dedicated website (Ryanair.com > Log in > Dashboard > Erasmus) and follow the booking process. Please always take your ESNcard with you when travelling. How do I get an ESNcard? Your membership card (ESNcard) can be acquired from any one of over 500 ESN sections in 40 countries across Europe. For a list of distribution points, visit ESNcard.org/getcard. If there is no ESN section at your university or if you are a trainee/EVSer, please contact the section that is closest to the location of your hosting institution. Why is the validation process taking so long? The ESNcard validation is not live, therefore it might take some time to be processed. If the validation process takes more than 48 hours and the only notification that you see says This information will be validated by ESN, please check the widget below the registration form. If it says You have 8 discounts left, your ESNcard has already been validated and you are welcome to start using your Ryanair discount now. If you don’t see this notification, please remove your ESNcard data from the registration form and submit it again. Make sure that the information you submit is correct (as in: compliant with your ESNcard user account details). Why does the system reject my ESNcard details? 1) Have you ever registered at ESNcard.org by yourself? If not, please create an account at ESNcard.org/register. 2) Have you added your ESNcard number to your ESNcard.org user profile? If not, please do so. Also for the rest of the information requested (phone number is not mandatory). 3) Do you have any spelling mistakes or unnecessary spaces in your first name and/or surname either in your ESNcard.org user profile or your myRyanair validation section? 4) Have you split your full name in the same way on both your profiles on ESNcard.org and myRyanair? 5) Have you entered the same date of birth in both platforms? 6) Are you sure you have entered in myRyanair your HOME university name (the one you come from), and not your host university name (the one where you are doing your exchange at)? Please select the same HOME university in both platforms. Why is my ESNcard number “already in use”? If you have received this notification, your ESNcard number is, in all likelihood, assigned to another Ryanair account. Try using another email address while logging in or log in to the platform with Facebook. If you are unable to log in with Facebook, please log in with your email address and password that you normally use for your Facebook account. Will cancelling my account at ESNcard.org and creating a new one help with the Ryanair validation process? No, it will not. Your ESNcard number is assigned to the email address that you registered the card with. If you cancel your account, you will not be able to create a new account with the same ESNcard number or log in to the previous one. Consequently, completing your Ryanair validation form will become impossible. To stay up to date with the latest news regarding the #RyanairErasmus discount, follow us on Erasmus Student Network and ESNcard Facebook pages. To know more about over 2,000 discounts and advantages you can get with your ESNcard all around Europe, visit ESNcard.org.